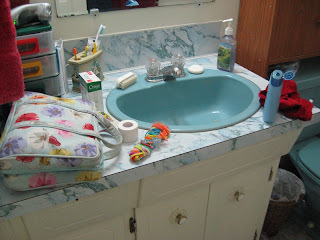 I was brushing my teeth with one hand and straightening the bathroom counter with the other as I overheard a little exchange between two of my three children in the bathroom with me. Normally, I'd add it to a 'Little Things They Say' post, but there will be plenty of other little things to add there later. 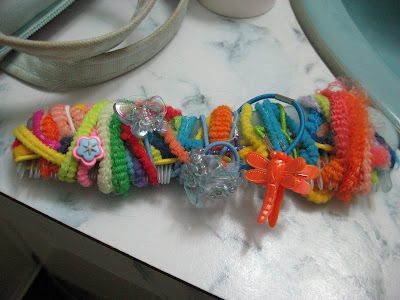 Dolly had gone to the bathroom, and I'd been summoned when she was finished - actually sent for via the person of PC, who carefully and softly said in my ear, "Nanna weih poout.". I arrived at the bathroom, did my motherly duty and then proceeded to tackle the unpacking of the cosmetic and medicine bags from our trip. PC: "Nanna, Ouoo wen poout?" Dolly very matter-of-factly: "Yep, a lot." PC - extreme sympathy in his voice: "Oh, poor Nanna!" Dolly: "It's not poor Nanna! I did a good job." PC - heartily sincere: "Oh! Good job, Nanna!" Dolly smiling with approval of his adjustment: "Thanks!" All is quite for a few seconds except for the toy car being driven along the wall and the shuffling of three pairs of feet as they continue to mill about. PC: "Ouoo ah mommy, Nanna?" PC: "Ouoo ah mommy, meah dah-ee." Dolly: Yeah, I can be the mommy, you can be the daddy and she (indicating Emma) can be the baby. Come on, Daddy and Baby, we have to go to the store!" 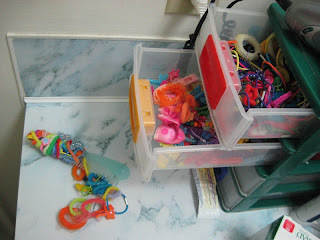 I finish sorting the zillions of hair elastics and clips. And now I should be off making lunch. I love the mommy and daddy dialogue, so cute!